The Replacement Sensor Mat works with a Care Solutions Transmitter and Receiver to alert carers when their patient leaves a chair or room. Ideal for use as a spare mat when cleaning your main one. For best results, this item should be used with the Lifemax Transmitter and Receiver for the Wireless Alarm Kit. Tick item to add it to your purchase. 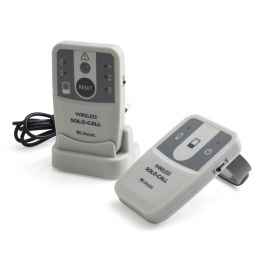 The Wireless Care Alarm Kit helps you to monitor an elderly patient by alerting you of specific activities, for example if they leave their bed. The kit is particularly beneficial for use at night-time or if your patient is prone to wandering off, allowing you to keep track of them even from another room. Without having to constantly be by their side, you can respect your patient or loved one's space without compromising their safety. It is important to regularly clean your sensor mats to minimise infection (see cleaning instructions below). With regard to this, if you already have the Care Alarm Kit with Chair Sensor Mat, you might consider a Replacement Chair Sensor Mat. This ensures that you will not be without protection if your current mat is being cleaned. The square Replacement Chair Mat is also handy if you already own the Bed Leaving Sensor Kit, giving you the option of changing to a smaller sensor mat, for use on a chair or wheelchair as well as a bed, if you so wish. How does the replacement chair sensor mat work? The Replacement Mat works just the same as the current mat in your Care Alarm Kit. 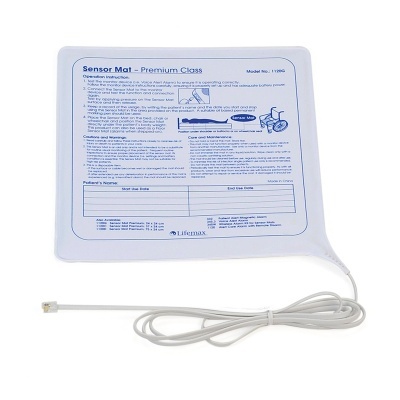 All you need to do is place your mat where you please, for example on your patient's wheelchair, and connect it to your existing alarm transmitter. Then, if pressure is either applied to or released from the mat, indicating someone leaving the chair, bed or room, you will be alerted with light, sound or vibration. The Wireless Alarm Kits can only operate using one sensor at a time, making the Replacement Sensor ideal for use when you are cleaning your main sensor mat, or if you want something smaller than the Bed Leaving mat. The Wireless Care Alarm Kit and Sensor Mats are designed for indoor use only. Store the mat flat and do not fold or bend it. Wipe clean only with a non-caustic sanitising solution - do not immerse the mat in any liquid/solution. The mat should be cleaned regularly, and before use. To minimise the risk of infection, do not share mat between patients. Please note that if you have a pacemaker installed, this product may be unsuitable for your use. Please consult a medical professional before purchase for more information. The Replacement Sensor Mat works with a Care Solutions Transmitter and Receiver to alert carers when their patient leaves a bed or room. Ideal for use as a spare mat when cleaning your main one. A transmitter and pager receiver for use with your Care Solutions Sensor Mat. 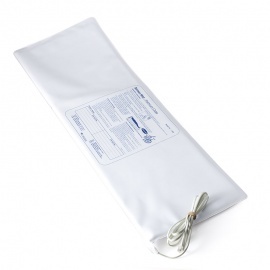 Ideal for monitoring elderly loved ones, you will be notified if pressure is applied to or removed from a mat. A wireless transmitter, pager and sensor system which uses sound, light and vibration signals to alert user if someone has left their chair. Ideal for use by carers with elderly patients.